One of the first things I did on arriving back in Singapore in July 2013 was to go out and buy a curry puff to eat. My favourite curry puffs are sold by what was the former Polar Cafe. It was founded by a man called Chan Hinky who arrived in Singapore from Hong Kong with only 90 cents in his pocket. In 1926 he realized his dream of opening a cafe (at 51 High Street, the same street as where my grandfather had a tailoring business). He called it Polar Cafe and I have fond childhood memories of being taken there for a snack. In 1986 the cafe was acquired by the government to make way for the new Parliament House and Chan then switched to a take-away outlet. Being halal certified in 2001 helped expand the business clientele to include Muslims. Now called Polar Puffs and Cakes it has grown to 62 outlets dotted across the city. They sell a variety of baked treats besides their signature curry puff. 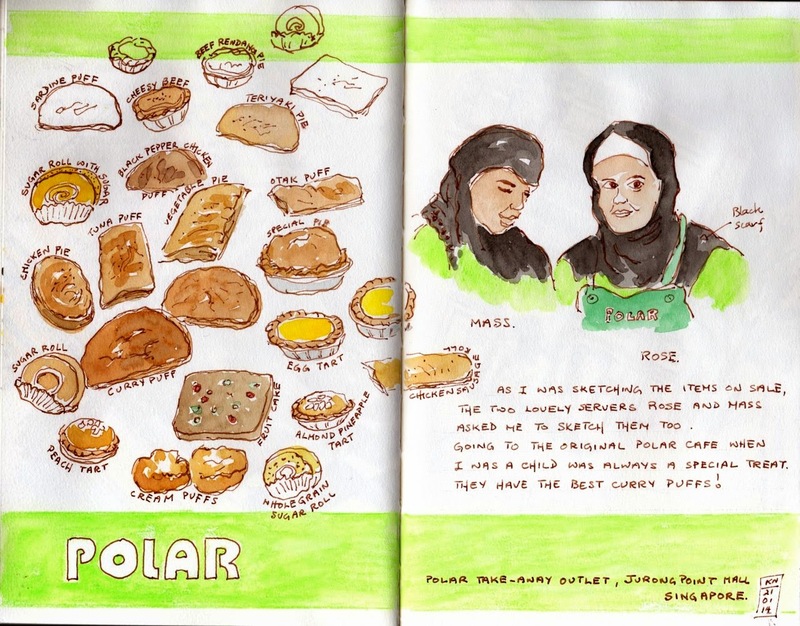 I had to explain myself to the servers as I sketched this at the Polar Puffs and Cakes outlet at Jurong Point Mall. The two lovely muslim servers asked me to sketch them too. The curry puff is a crescent shaped baked snack. Puff pastry is filled with curried meat and potatoes…or is that flaky pastry? This opens up a whole new discussion. Historically it is thought to have sprung from the post war epok-epok which Malay ladies sold door to door. This was a fried pastry filled with spicy sardines or potatoes. It is thought to have been inspired by the British Cornish Pasty introduced by British colonists. Others think it was influenced by the similar shaped Portuguese empanada brought by Portuguese colonists much earlier in the 1500's. The Indian samosa is undoubtedly also an influence despite being triangular in shape. The snack was modified by the Chinese who produced a version filled with curried potato and some pieces of hard boiled egg. This is recognized as the modern day curry puff. This modern day version (popular in Singapore and Malaysia) is sold at outlets and cafes. High end hotel cafes serve them as well and tourists probably see them as a British colonial legacy. The other main chain businesses well known for curry puffs are Old Chang Kee (which sells a deep fried version with a thicker crust) and a favourite of mine Delifrance…but writing about them calls for another sketch and post.